More and more companies need a toolbox to help them interact in real time with partners, clients and even remote employees. However, running remote meetings in particular comes with its own challenges. Sometimes the participants are on different time zones. Everyone needs to be updated prior to the meeting regarding the topic of the conversation. Tasks have to be shared and everyone must have a clear understanding of the entire project. Not to mention the online meeting itself has to unfold without any technical problems. As you can see, an online meeting cannot happen without having a bunch of tools in place, and they usually don’t come cheap. Further on I’ve gathered a list of tools (most of them, free) that can help teams overcome most challenges and make meetings more focused and productive. It’s never been easier to find the right time for a meeting with people living in different time zones. World Time Buddy is a friendly tool that allows you to add multiple locations, find the right time and schedule it in either Google or Outlook Calendar. You can even overlay your Google Calendar events to see when you have a spare time slot. Best thing about it: I love how simple it is to use it. If you need to run a one-to-one meeting with someone outside your organization, this is your go-to app. Hubgets Page is part of the Hubgets suite and works like an interactive business card. Once you log in to Hubgets, you can create and customize your own web page for instant communication. You can use the tool not only to hold the meeting (via phone or video conferencing), but also to collaborate afterwards. You can chat and share any type of file, from documents and archives to media files, no matter the size. For your business partners and clients, it’s incredibly easy to reach you. They don’t have to install any software. You can either send them an invitation from Hubgets or share your Hubgets Page custom link with them. Easy as pie! Best thing about it: It’s FREE forever! Simply create your Hubgets account. 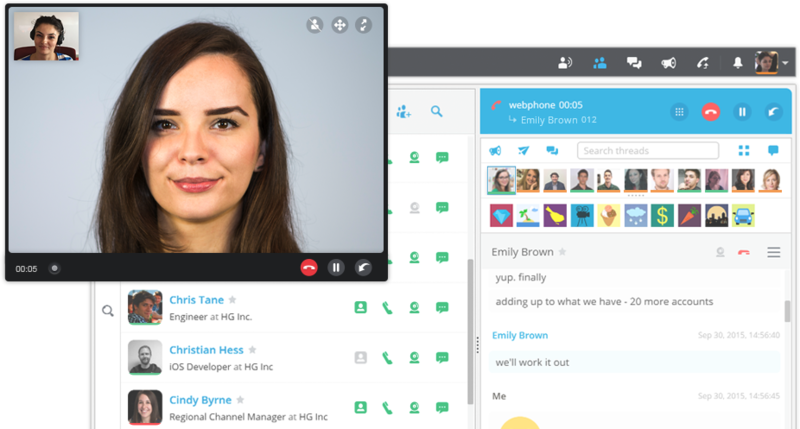 If you’re mostly looking for a video call with users in multiple locations, try GoToMeeting. It’s a very popular tool among webinar organizers. It offers a 30-day free trial period, after which you have to pick one of their paid plans (starting at 29$/month). Best thing about it: It’s great for online meetings with people from multiple locations. 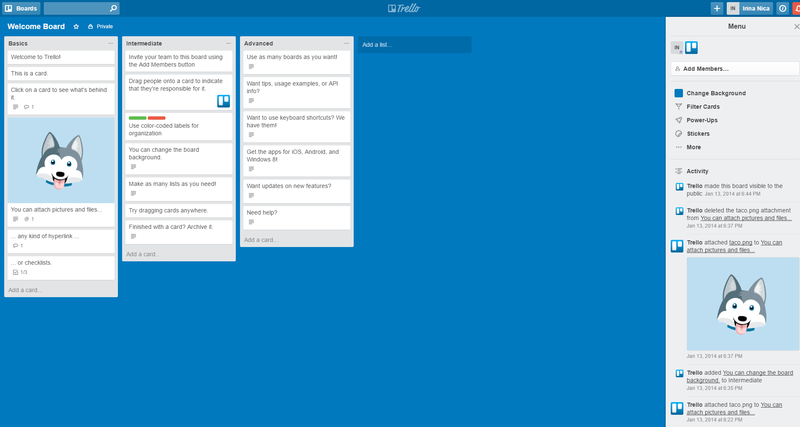 Trello is a beautifully designed project management tool that allows you to get a macro view of a project by looking at the Trello “board” and checking on the progress in real-time. Your team has the flexibility to add tasks, assign them, add checklists, labels and more. It’s great for agile work, but you can organize the boards in any way you feel is right for your business. Best thing about it: You can organize the boards however you want, invite collaborators and, yes, it has a freemium versions. Have you got really-really large files to share? OneHub lets you keep them all in one place, with enterprise-grade security. You can customize your workplace with a domain name of your choice. It even integrates with Google Drive. Of all the tools recommended herein, this is probably the most expensive. Their team package starts at $ 29,95/mo, but if your business requires private collaboration on large files – OneHub is worth giving a try (offers a 14-days free trial). Best thing about it: The maximum file size goes up to 5GB. Imagine yourself on an online meeting with a prospect or a partner, and you want to seal the deal. What do you do next? The “print, sign, scan, email” system is way too slow for our fast-paced digital world. Now you can get things signed right then and there, with Hello Sign. Check out their list of features; it’s really impressive how flexible their product is. Best thing about it: Saves you from a lot of bureaucratic work! Now that I’ve introduced you to these very useful products, you have even more logins to remember. Of course you can have them all listed in a document where your team has access, but isn’t that so 2015? LastPass’s Enterprise package comes in handy whenever a teammate needs to log in to any of the services you use, without having to know the login credentials. Best thing about it: Saves you time during meetings, when you want everyone to log in to a certain service, such as the Trello board, and start collaborating right away. Was this list useful? Let us know what you think in a comment below.